Wilson High seniors Sarah Birong, Koby Taing, Devyn Ellis and Olivia Salaben will join the show’s professional touring band for the songs "Eleanor Rigby," "Yesterday," "A Day in the Life," "Hello Goodbye" and "Hey Jude." All quartet members performed with the school’s Symphonic Orchestra, which last year earned the Outstanding Orchestra Award at the Regional Heritage Music Festival and was selected as one of 13 high schools to perform at Carnegie Hall in New York City. All members play with the All-District Honors Orchestra and consistently receive superior ratings at solo and ensemble festivals. "In My Life" is the musical retelling of the Beatles story through the eyes of manager Brian Epstein and features the live music of renowned tribute band, Abbey Road. The producers of "In My Life" approached Wilson Music Director Michelle Ellis looking for a talented ensemble who could hold their own with a rock band in front of an audience. Quartet member Salaben has been a Beatles fan since age eight when she began to play Fab Four tunes on the guitar. Her favorite song is “Strawberry Fields.” She volunteers with the Long Beach Symphony and plays varsity tennis. The cellist has earned straight A’s throughout high school and hopes to attend Harvey Mudd College to study astrophysics. Quartet member Birong, a violinist, hopes to study international economics in Sweden next year, and fellow violinist Taing aspires to obtain a degree in music education. Viola player Ellis plans to study music and psychology at a four-year university. “In My Life” plays at the Carpenter Center, 6200 Atherton St. in Long Beach at 8 p.m. on Saturday, Nov. 19. Tickets are $45 and may be purchased online at www.carpenterarts.org, by phone at 985-7000 or at the theatre box office. 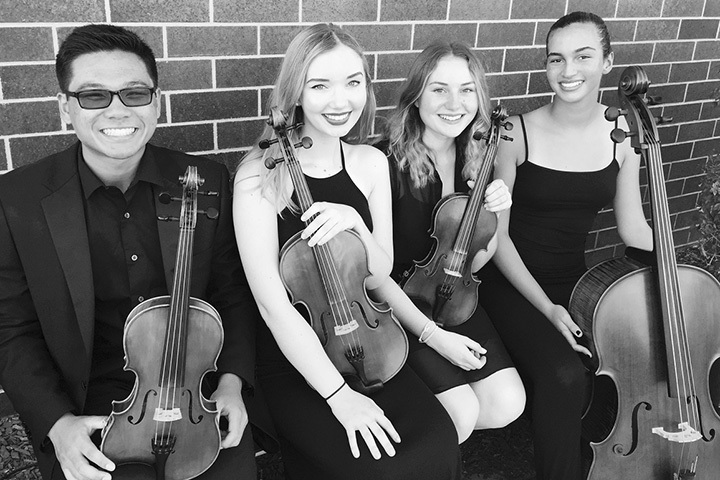 SCHOLARLY MUSICIANS – Wilson High School scholars and musicians Koby Taing, Devyn Ellis, Sarah Birong and Olivia Salaben will join professional performers during a Nov. 19 musical tribute to the Beatles. Wilson also was one of 13 high schools to perform recently at Carnegie Hall in New York City.